Salmon steak with vegetables and dill garnish. Salmon steaks are thick cuts of the fish usually sold with the backbone intact. 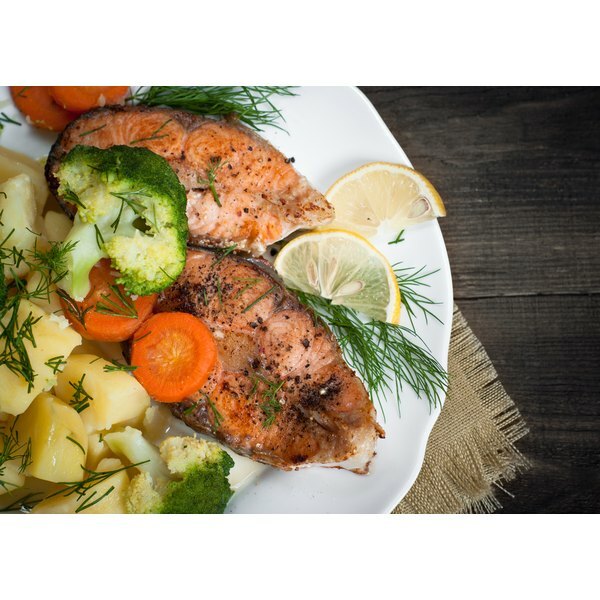 You can purchase salmon steaks for much cheaper than fillets because of the bone in the fish, but the flavor and health benefits in a salmon steak are exactly the same. Salmon is loaded with essential omega-3 fatty acids, which are heart-healthy nutrients that can lower cholesterol levels and reduce the risk of developing heart disease. Assemble a broiler pan by placing the rack on top of the rimmed pan. Place the salmon steaks on top of the pan. Use a pastry brush to coat the salmon steaks with melted butter or olive oil. Sprinkle the steaks with salt and pepper. Place the broiler dish in the oven, 4 inches from the top heating element. Close the oven and let the salmon cook for five minutes. Flip the salmon steaks with a spatula and close the oven. Let the salmon cook on the second side for five more minutes. Check the salmon for doneness. The center of the fish should be flaky and opaque. Remove the fish from the oven and serve hot with your desired sauce, such as teriyaki sauce or horseradish. Rinse the salmon steaks and pat them dry with a paper towel. Season the steaks with salt and pepper. Heat a large nonstick saute pan on the stove top over high heat until very hot. Place the salmon steaks in the pan and immediately put the pan into the oven. Cook the salmon steaks in the oven for three minutes, then remove the pan and use a spatula to carefully flip the steaks over. Return the pan to the oven and cook for another three minutes. Check the salmon for doneness by using a fork to look at the center of the steak. When done, the salmon steaks will be opaque and flaky in the center. Remove the steaks from the oven and serve with sauce, if you'd like. Brush the broiler pan with melted butter or olive oil before placing the salmon on the pan to reduce sticking and making cleanup easier. Don't overcook the salmon. The fish will continue to cook once you take it out of the oven, so pull the fish out as soon as the center starts to look opaque. National Fisheries Institute: When Is Seafood Done?